Head over to the NASA site for larger versions. Seven years ago the shuttle Columbia broke up over Texas. Why did the administration pick this day to gut the Moon program? Had to share this one from xkcd. Click the image for the full comic. Look carefully and you’ll see moons and moon shadows zip by along the meridian with the Great Red Spot roiling just below center. Follow the link for more info. USA declares war on Venus! 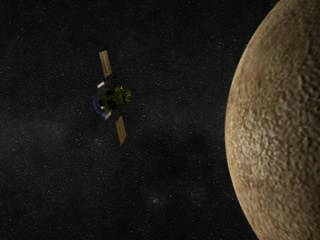 On June 5th the Messenger spacecraft used Venus to get a boost on it’s way to Mercury and took the opportunity to take out some Venusians on the way. Picture this: A spaceship swoops in from the void, plunging toward a cloudy planet about the size of Earth. A laser beam lances out from the ship; it probes the planet’s clouds, striving to reach the hidden surface below. Meanwhile, back on the craft’s home world, scientists perch on the edge of their seats waiting to see what happens. Author Michael HarrisonPosted on June 7, 2007 Categories News/GeneralTags clouds, nasa, news, News/General, USA, VenusLeave a comment on USA declares war on Venus!